A quick view of the most influential metrics in Kirkwood. Scroll below to view KIRKWOOD homes for sale. Kirkwood residents enjoy parks, close proximity to downtown Atlanta and Decatur, fantastic value and a spirit of “joie du vivre”. Kirkwood a popular intown Atlanta destination. Looking to buy or sell a home in Kirkwood? 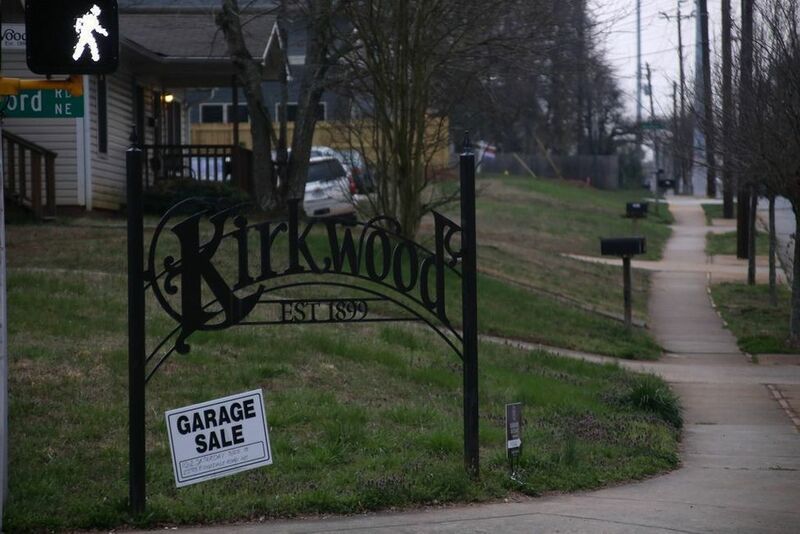 While Kirkwood's residential community began to flourish by the late 1990s, the community's business district running along Hosea L. Williams Dr. (Then Boulevard Dr.) remained stagnant. A major problem with any planning efforts gaining traction to raise the quality of the downtown area was the fact that properties along the district had varying zoning designations governing their density and use. In 2001, the community obtained Neighborhood Commercial (NC-3) Zoning that allowed for consistency in planning efforts. In 2003, work began on Phase I of a $1.5M streetscape project in the district that, coupled with earlier zoning changes, served to create an environment that would attract small business and private commercial development to the area. The streetscape project increased pedestrian access by narrowing street crossings, slowing traffic, installing protected crosswalks and bicycle lanes on Hosea Williams, and building wider decorative sidewalks. The visual element of the project added historic street lighting, removal of several power poles, decorative brick pavers, trash cans and bike racks. Today, Downtown Kirkwood has become what neighbors call "the small town in the big city," hosting its own post office, newly constructed fire station, police precinct and public library. Residents and visitors also have a host of shopping and dining options at their disposal, including: day spas, furniture galleries, gift shops, restaurants, bars, a wine store, coffee shops, real estate offices, professional/creative spaces, salons, dance studios, yoga studios, and more. The Kirkwood Business Owners' Association (KBOA) represents local businesses and recently installed new gateway signage and landscaping at the main traffic island on Hosea Williams Drive. The KBOA also promotes and markets Kirkwood Events and businesses. View our selection of available properties in the Kirkwood area. Check out the latest demographic information available for Kirkwood. Browse through the top rated businesses in the most popular categories Kirkwood has to offer.